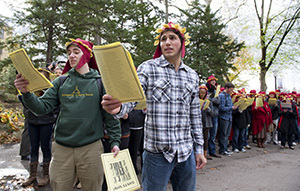 Please join Italian Studies at Notre Dame for an afternoon of recitations of excerpts from Dante’s Commedia performed around campus, followed by a lecture by faculty members Theodore Cachey, Christian Moevs and Anne Leone, and a reception. View the video of lthe inaugural Dante Now! performance, and to read an article published in The Observer on September 26, 2013 about the event. You are invited to join in or to watch the performances. Co-sponsored by the William and Katherine Devers Program in Dante Studies, Italian Studies at Notre Dame, and the Ravarino Family Endowment for Excellence in Italian Studies. If you are interested in performing, please contact Anne Leone at italstud@nd.edu to RSVP for one of the reader workshops taking place on Wednesday, Sept. 27 from 9 a.m. to 2 p.m. Contact Anne Leone at italstud@nd.edu for more information and to RSVP for one of the reader workshops in the Hospitality Room, South Dining Hall on Wednesday, Sept. 27, 9 a.m. - 2 p.m.